Academic and Policy Press author Tony Fitzpatrick has been musing on the state of UK social policy and the effectiveness of welfare reforms since 1945. Many expect that in the next few years we will experience an Armageddon in UK social policy, with the effective privatisation of the NHS, the proliferation of profit-making schools, the increased outsourcing and marketisation of public services more generally, and increased levels of poverty and inequality as a result of government austerity. But these pessimists and naysayers are overlooking something important about the near future. Here’s why. This refrain has been heard repeatedly since 1979. In fact, it began the day after the Elizabethan Poor Law was enacted in 1601, but leave that point to one side. 1979 was the year a government was elected which was dedicated to ending benefit and welfare dependency. Ever since then successive governments have more or less sung the same song. Of course, quite soon a difficulty builds up. If the welfare state’s unconditional, milk-and-honey culture has produced endless social problems, how to account for the effects of economic and social reforms since 1979? As the welfare state becomes more and more conditional, and as markets and consumerism play a greater and greater role, then it becomes harder to maintain that social problems are due to a post-WW2 system that encourages people to take, take, take. It’s at this point that politicians turn into vampires. Just as vampires don’t see their own reflection in a mirror, so politicians are often adept at ignoring their own role in creating existing social and economic conditions. Take the strategy of most Secretaries of State in the last government. Every few months some new shake-up was announced in which unemployed claimants/scroungers/beggars/single mums/teenagers/asylum-seekers/deadbeat-dads would no longer be allowed to sit at home all day having children and watching Countdown. This would be announced on BBC news as ‘the greatest reform to the welfare state since Beveridge’, etc etc. Time would pass. Then a few months later, basically the same initiative would be re-announced as if nothing had happened beforehand. This is one reason social policy debates often resemble some malicious echo chamber in which the same ideas bounce around for decades by being refurbished as radical and innovative. Overall, governments have swept the negative effects of their own policies and interventions to one side in the search for headlines and votes. The narrative of the last 3 decades has been this, then. The years after 1945 after filled with social policies that distributed all sorts of goodies and presents to people and asked nothing in return. This was the era of ‘passive welfare’. Only a few brave, lone voices in the wilderness warned us where it was all going: laziness, dependency, economic catastrophe, and so on. By 1979 a grateful nation had awoken to its moral decline, vowed to pull its socks up and give a good kicking to those indigents who insisted on not getting the message. After 34 years the party was over; time for responsible adults to clean the house. This is now the era of ‘active welfare’. Is this idyll the society in which we now live? Can you think of anyone who imagines this is the case? Why isn’t middle England content, for instance? Let’s think of the possibilities. One is that we were simply too optimistic about the task to be done. Turns out that the 1945-79 period was one of such decline that it may take generations, of instilling discipline and respect for authority in the rabble, to rectify. Another possibility is that too many politicians of all parties have been living in a fantasy of their own making and have been trying to conjure that fantasy into reality by ignoring their own previous and ongoing role in creating a highly unequal, anxious, scapegoat-seeking and often punitive country. For instance, New Labour’s defence of its record was simple. In unfavourable circumstances – global hypercapitalism, corporate governance, post-national sovereignty, knowledge economies, and a culture of political apathy – it did all a modern social democratic party can do. Poverty was reduced. And following 4 years of Coalition government, its record doesn’t seem that bad now, does it? Yet its modest progress on poverty stalled around 2003; ‘the excluded’ were Othered in a way that has increased middle England paranoia about destitute spaces, feral youth, social-moral meltdown and anti-social whatever; and it did little to reduce the levels of inequality it inherited in 1997. So, according to the prevailing narrative, in the 34 years from 1945-79 we had a hedonistic, unconditional welfare state which failed. Well, by 2013 we had had 34 years since 1979. Will this lead to a sober, objective appraisal of where those 3 decades have left us and why? Will we conclude that if 34 years was long enough for one type of system to fail, it is also long enough for another to fail too? Will we turn ourselves away from a political and economic system that tolerates massive inequalities, the intrusion of free markets into practically everything, an assumption that private is always best because the public sector is inefficient, underemployment and overwork (including some of the longest working hours in Europe), high levels of child poverty, insecurities, personal acquisitiveness and selfish individualism, and all the regulations designed to control personal behaviour? 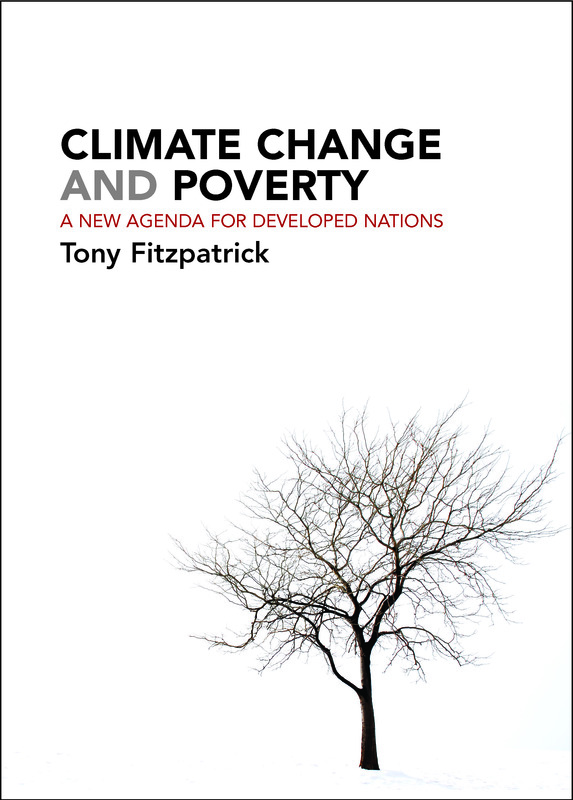 Tony Fitzpatrick’s latest book Climate change and poverty: A new agenda for developed nations is available at the discounted price of £19.99 (RRP £24.99) from Policy Press website here. We have to change the political psyche of this country. what’s on the agenda is unacceptable.